Many names have been given to me. I have been called the "Virgin of the Passion". "the Golden Madonna", "the Mother of the Redemptorist Missionaries", "the Mother of Catholic homes". 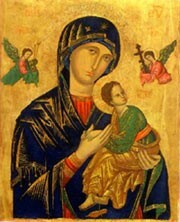 The name of my own choosing is "Mother of Perpetual Help". It is also the name by which Pope Pius IX requested the Redemptorist Missionaries to make me known. My story is of how Heaven hallows human happenings for purposes divine. It is a history that appears complicated and adventurous, but seen 'from above" it is a simple, straight line drawn through human history. It is the story of an unknown artist, a repentant thief, a curious little girl, an abandoned church, an old religious and a Pope. And above all, it is the story of my presence in the apostolic life of the Missionaries of the Congregation of the Most Holy Redeemer. The Merchant Who Stole "Our Lady"
There is a tradition from the 16th century that tells us about a merchant from the isle of Crete who stole a miraculous picture from one of its churches. He hid it among his wares and set out westward. It was only through Divine Providence that he survived a wild tempest and landed on solid ground. After about a year, he arrived in Rome with his stolen picture. It was there that he became mortally ill and looked for a friend to care for him. At his hour of death, he revealed his secret of the picture and begged his friend to return it to a church. His friend promised to fulfill this wish, but because his wife did not want to relinquish such a beautiful treasure, the friend also died without fulfilling the promise. At last, the Blessed Virgin appeared to the six year old daughter of this Roman family and told her to tell her mother and grandmother that the picture of Holy Mary of Perpetual Help should be placed in the Church of St. Matthew the Apostle, located between the basilicas of St. Mary Major and St. John Lateran. The tradition relates how, after many doubts and difficulties, "the mother obeyed and after consulting with the clergy in charge of the church, the picture of the Virgin was placed in St. Matthew's, on the 27th of March, 1499". There it would be venerated during the next 300 years. Thus began the second stage of the history of the icon, and devotion to Our Mother of Perpetual Help began to spread throughout the city of Rome. St. Matthew's Church was not grand but it possessed an enormous treasure that attracted the faithful: the icon of Our Mother of Perpetual Help. From 1739 to 1798, the church and adjacent monastery were under the care of the Irish Augustinians who had been unjustly exiled from their country and used the monastery as a formation center for their Roman Province. The young students found an asylum of peace in the presence of the Virgin of Perpetual Help while they prepared themselves for priesthood, the apostolate and martyrdom. In 1798, war raged in Rome and the monastery and church were almost totally destroyed. Several Augustinians remained there for a few more years but eventually they, too, had to leave. Some returned to Ireland, others to new foundations in America, while the majority moved to a nearby monastery. This last group brought with them the picture of Our Lady of Perpetual Help. Thus began the third stage of her history, the "Hidden Years". In 1819, the Irish Augustinians moved to the Church of St. Mary in Posterula, near the "Umberto I" bridge that crosses the Tiber River. With them went the "Virgin of St. Matthew's". But as "Our Lady of Grace" was already venerated in this church, the newly arrived picture was placed in a private chapel in the monastery where it remained, all but forgotten, but for Brother Augustine Orsetti, one of the original young friars from St. Matthew's. The years passed and it seemed that the picture that had been saved from the war that destroyed St. Matthew's Church, was about to be lost in oblivion. "This good brother used to tell me with a certain air of mystery and anxiety, especially during the years 1850 and 1851, these precise words.- 'Make sure you know, my son, that the image of the Virgin of St. Matthew is upstairs in the chapel: don't ever forget it... do you understand? It is a miraculous picture. 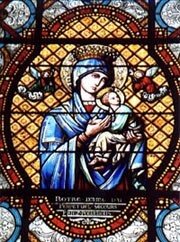 'At that time the brother was almost totally blind "What Ican say about the venerable picture of the 'Virgin of St. Matthew' also called ' Perpetual Help, ' is that from my childhood until I entered the Congregation (of the Redemptorists) I had always seen it above the altar of the house chapel of the Augustinian Fathers of the Irish Province at St. Mary in Posterula... there was no devotion to it, no decorations, not even a lamp to acknowledge its presence... it remained covered with dust and practically abandoned. Many were the times, when I served Mass there, that I would stare at it with great attention." Brother Augustine died in 1853 at the venerable age of 86, without seeing fulfilled his desire that the Virgin of Perpetual Help be once again exposed for public veneration. His prayers and boundless confidence in the Virgin Mary seemed to have gone unanswered. In January of 1855, the Redemptorist Missionaries purchased "Villa Caserta" in Rome, converting it into the general house for their missionary congregation that had spread to western Europe and North America . On this same property along the Via Merulana, were the ruins of the Church and Monastery of St. Matthew. Without realizing it at the time, they had acquired the land that, many years previously, had been chosen by the Virgin as her Sanctuary between St. Mary Major and St. John Lateran. Four months later, construction was begun on a church in honor of the Most Holy Redeemer and dedicated to Saint Alphonsus Liguori, founder of the Congregation. On December 24, 1855, a group of young men began their novitiate in the new house. One of them was Michael Marchi. The Redemptorists were extremely interested in the history of their new property. But more so, when on February, 7th, 1863, they were puzzled by the questioning from a sermon given by the famous Jesuit preacher, Father Francesco Blosi, about an icon of Mary that "had been in the Church of St. Matthew on Via Merulana and was known as The Virgin of St. Matthew, or more correctly as The Virgin of Perpetual Help. " On another occasion, the chronicler of the Redemptorist community "examining some authors who had written about Roman antiquities, found references made to the Church of St. Matthew. Among them there was a particular citation mentioning that in the church (which had been situated within the garden area of the community) there had been an ancient icon of the Mother of God that enjoyed 'great veneration and fame for its miracles.'" Then "having told all this to the community, a dialogue began as to where they could locate the picture. Father Marchi remembered all that he had heard from old Brother Augustine Orsetti and told his confreres that he had often seen the icon and knew very well where it could be found." "December 11, 1865: The Cardinal Prefect of Propaganda will call the Superior of the community of Sancta Maria in Posterula and will tell him that it is Our desire that the image of Most Holy Mary, referred to in this petition, be again placed between Saint John and St. Mary Major; the Redemptorists shall replace it with another adequate picture." According to tradition, this was when Pope Pius IX told the Redemptorist Superior General: "Make Her known throughout the world!" In January, 1866, Fathers Michael Marchi and Ernest Bresciani went to St. Mary's in Posterula to receive the picture from the Augustinians. Then began the process of cleaning and retouching the icon. The task was entrusted to the Polish artist, Leopold Nowotny. 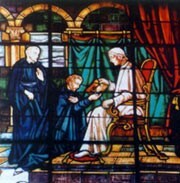 Finally, on April 26th, 1866, the image was again presented for public veneration in the Church of St. Alphonsus on the Via Merulana. With this event, the fourth stage of her history began: the spread of the icon throughout the world. In 1990, the picture of Our Mother of Perpetual Help was taken down from above the main altar to satisfy the many requests for new photographs of the icon. It was then that the serious state of deterioration of the image was discovered; the wood, as well as the paint, had suffered from environmental changes and prior attempts at restoration. The General Government of the Redemptorists decided to contract the technical services of the Vatican Museum to bring about a general restoration of the icon that would deal with the cracks and fungus that threatened irreparable damage. The first part of the restoration consisted of a series of X-rays, infra-red images, qualitative and quantitative analyses of the paint, and other infra-red and ultra-violet tests. The results of these analyses, especially a Carbon-14 test, indicate that the wood of the icon of Perpetual Help could safely be dated from the years 1325-1480. The second stage of the restoration consisted of the physical work of filling the cracks and perforations in the wood, cleaning the paint and retouching the affected sections, strengthening the structure that sustains the icon, etc. This physical intervention was limited to the absolute minimum because all restorative work, somewhat like bodily surgery, always provokes some trauma. An artistic analysis situated the pigmentation of the paint at a later date (after the 17th century); this would explain why the icon offers a synthesis of oriental and Occidental elements, especially in its facial aspects.